It should come as no surprise to my readers that I love rum. Burbons I hate; tequila makes me loco; vodka reminds me too much of college hangovers; gin can be refreshing; but rum— ah, rum!— the primero choice of scuba divers and pirates alike. As I’ve mentioned before, The Kraken is my new favorite rum (at least since I can’t get my hands on the nectar that is Flor de Caña in Hawaii). I love a nice glass of this delicious dark spiced rum on the rocks, but my liver does object to consuming such a stout drink on a routine basis. As such, I’ve tried blending The Kraken with a variety of diluents with mixed results. Definitely tasty, but the rum and Coca Cola thing has been so overdone for me that this was nothing special. I actually prefer the taste of Sailor Jerry’s and Coke, which gives the drink a taste similar to Dr. Pepper. Rum and pineapple is my absolute favorite mixed drink, and The Kraken doesn’t disappoint. Extremely drinkable even mixed at intensities as high a 2:1 rum-to-juice ratios. Admittedly, I prefer the taste of Flor de Caña and pineapple juice (the beloved ron y piña), but The Kraken is a close second. All I’ve been able to find on Hawaii is mango nectar, which needs to be diluted slightly with water to become drinkable. That said, once stirred in with some of The Kraken, this a very nice drink that works best at a 3:1 rum-to-juice ratio. Not a fan. In my opinion, Sprite is better suited for gin drinks. I’d rather have The Kraken on the rocks. JACKPOT! This is the way to mix The Kraken. The alcohol is barely noticeable up to levels of 4:1 rum-to-juice. At higher concentrations (even up to 1:1) the drink tastes similar to a Long Island Ice Tea and is therefore extremely potent. I highly recommend making this drink with real lemonade and not some sugary imitation. Yeah, I know mojitos are supposed to be made with a light rum, but the spiced base of The Kraken makes mojitos with this liquor a real treat. Use liberal amounts of mint to offset the darkness of The Kraken. One caveat: bear in mind that I genuinely enjoy the taste of rum and therefore mix my drinks fairly strong. 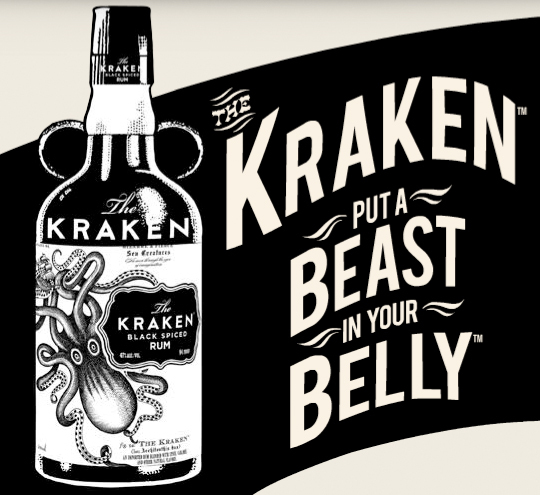 If the aforementioned ratios are a bit much for you, consider diluting The Kraken a bit more (though doing so is such a shame…). From our time in Belize I can heartily recommend the following. That’s all you need… it’s better if you can pay someone to make you up a gallon jug of coconut water all at once, then just work through the rum steadily. Try it with ginger ale. I use the diet version, and woah boy what a compliment to that delicious rum. Kraken and root beer, you can go at least 1:1 ratio and bairly tast the alcohol, much better than kraken and coke. The best drink i can think of is a dark and stormy: 2oz ginger beer in a small tumbler with ice float 2 oz kraken on top and serve (have your guests stir prior to drinking) my most favorite beverage by far. We call it a pirate ale. Woodchuck Amber with a shot of Kraken. Had it at the local pirate festival. I’ve only had Kraken two ways. My very first was with Coke, and I wasn’t the least bit disappointed, but let me tell you. Kraken and Root Beer is perhaps the best thing I’ve ever flung down my esophagus. I’ve mixed up to 2:1 and kept it there for good measure, but at a 1:1 the best way I could describe it is almost exactly the same flavor as the rainbow snow cones with the bubblegum ball at the bottom from the Ice Cream Trucks that I frequently ate as a child. Upon realizing this my mind exploded, but I advise everyone to try it once, it’s intensely delicious. Came up with this on vacation. Mix in shaker filled with.ice, strain into old fashioned glass. Garnish with cinamon stick. Pretty good. Way better than with Sprite (which I didn’t like at all). Haven’t tried a lot of mixes. Tastes sweet and a little spicy. My favorites, Kraken and Cream Soda, Kraken and Dr. Pepper, or my personal favorite… The Space Pirate, which is Kraken in Tang. LOL! The Kraken lives at the bottom of the ocean which is sailed by Captain Morgan… halfway through the drink the captain and kraken mix together bringing Captain Morgan to a fight to the end with the deadly Kraken. sounds pretty out there but when i thought of it i was pretty out there already. as i was reading your drink mixes i noticed that you did kraken and cola, i tried this as it is a classic when i first sampled the beast, and it was definitely my favorite rum/coke combination to date. but in the fridge we had a couple of cans of Dr.pepper and since i love Dr.pepper i decided to mix the two and i was far from disappointed, if you like kraken i would definitely recommend it. I will try it with lemonade as that does sound awesome. You appear to have mixed up the way you report your ratios. A 4:1 rum-to-juice ratio would be 4 parts rum and 1 part juice, which would be rather MORE concentrated than 1:1. I believe you mean 4:1 juice-to-rum (or 1:4 rum-to-juice). Kraken on the rocks for me! top of with a splash of tequila.